I have always been keen on crosswords, sudoku and other puzzles, seeing them as a kind of "mental jogging". I am also a keen chess player, although I can't actually remember the last time that I won a game! A particular favourite is Killer Sudoku, which is a much harder version than the original. Speaking of jogging - to keep fit, I run three miles every day - come rain or shine! One hobby that takes up my few free moments is creating animations to display on YouTube using the standard ray-tracing program POV-Ray. So far, I have created five animations in my mini-series "Chronicles of the Little Black Blobs." Click here if you would like to see an example. I dabble a little in some creative writing when the mood takes me. 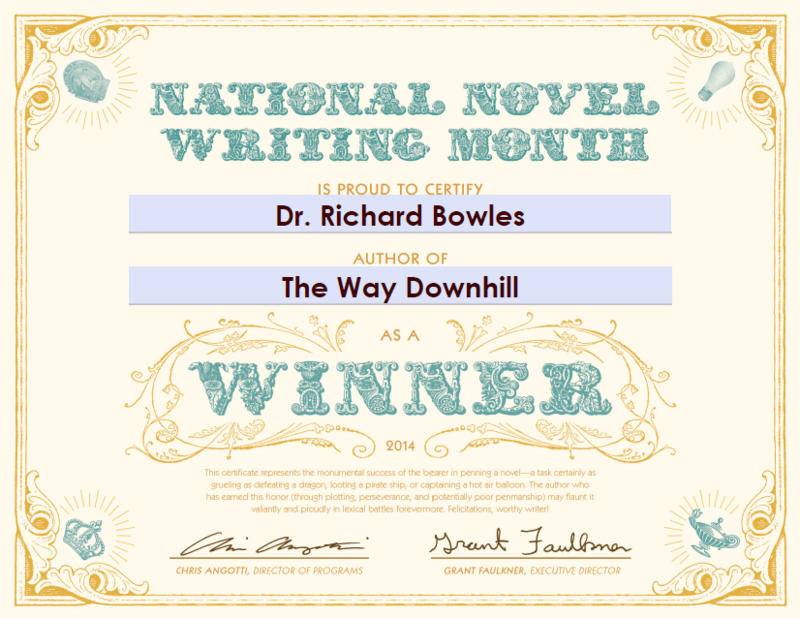 Indeed, I was one of the many winners of National Novel Writing Month 2014, which essentially means that I wrote a novel of at least 50,000 words in the space of a month, for which I was awarded a certificate. If you would like to see some of my efforts and have an account with the website Authonomy, search for Mish Mash: A Collection of Short Stories.